Our Abpromise guarantee covers the use of ab17355 in the following tested applications. WB Use at an assay dependent concentration. Detects a band of approximately 64, 67 kDa (predicted molecular weight: 49 kDa). The 67 kDa species is phospho myc. Immunoprecipitation analysis of H9 Human ES cells, using ab17355 to immunoprecipitate c-Myc. Cells were lysed in lysis buffer before being subjected to immunoprecipitation using the primary antibody overnight. Immunocomplexes were recovered with protein-G-sepharose beads. Samples were resolved by SDS-PAGE before transfer to PVDF membrane. The membranes were incubated with the appropriate antibodies and analysed by western blot. 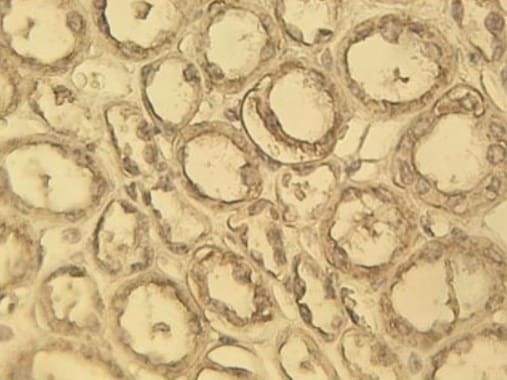 Immunohistochemistry of kidney tissue using ab17355 at 10 μg/ml. Publishing research using ab17355? Please let us know so that we can cite the reference in this datasheet. There are currently no Customer reviews or Questions for ab17355.